DUMBARTON came within four minutes of clinching a draw at Falkirk— but lost to a goal from sub Lee Miller. In front of a 4,311 crowd Sons started well and came close through Ryan Stevenson and Robert Thomson. Then Falkirk put their passing game together and began to dominate possession. Keeper Alan Martin produced an amazing save on the half hour, denying John Baird with a one-handed stop while diving the other way. Eight minutes later he made a similarly athletic block from Miles Hippolyte at point blank range. After the break Dumbarton began strongly, but the Bairns pressed back as the game swung from end to end, with Sons mainly looking to hit their opponents on the break. 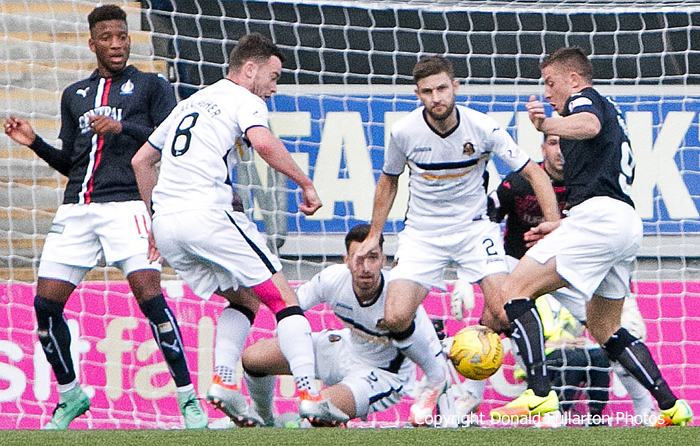 With 15 minutes to go and the match still goalless, Falkirk became increasingly urgent in their breaks forward. Finally, on 86 minutes, with the visitors so close to a precious point, Lee Miller broke Dumbarton hearts by side-footing past Martin with the winning goal. Despite the defeat, Sons are ahead of Falkirk in the SPFL Ladbrokes Championship, sitting fifth to the Bairns' sixth. After the game manager Stevie Aitken hailed the heroics of new keeper Alan Martin, and said his side deserved a draw. The picture shows Sons defenders blocking John Baird's route to goal.